Beginning deep within the Absaroka Mountains in southeast Yellowstone National Park, the Yellowstone River flows through the entirety of the park and then out the North Entrance, eventually joining the Missouri River in North Dakota. 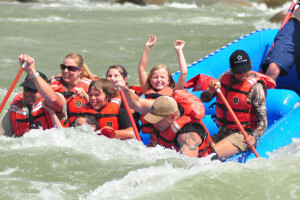 Enjoy rafting on the Yellowstone River, horseback rides in and around Yellowstone Park, and Zipline tours on our private ranch. Group rates and free gear rental. 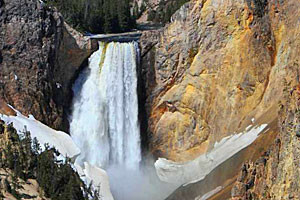 Trips available in Gardiner just outside Yellowstone Park, offering 2-hour scenic trips (3x daily), whitewater trips, plus horseback riding combos, and hiking trips in YNP. 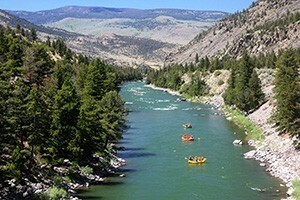 We started rafting the Yellowstone 40 years ago, and are still the leader in whitewater & scenic trips, beginner kayaking, horseback riding options and Chuckwagon dinners. 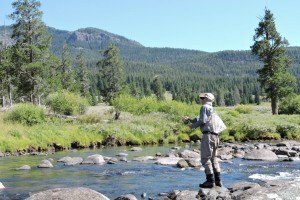 Starting at the Park border downstream, we guide over 120 miles of this productive trout river. 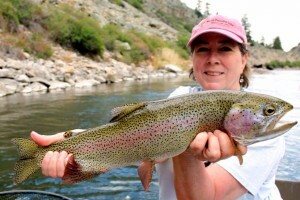 Our guides are experience, courteous, professional and fun. You'll be amazed. 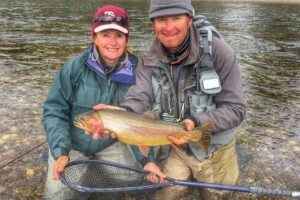 Offering guided fly-fishing trips in Yellowstone Park, the Paradise Valley, Ennis Montana and the Lower Madison near Bozeman Montana. Everyone loves fish pics like this. 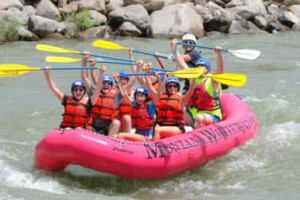 Flying Pig Rafting - our guests have more fun! We offer 8-mile whitewater raft trips (leaving 5x daily), plus scenic trips running 3x daily, longer rafting trips and Saddle & Paddle combo trips. Lots on the Yellowstone. 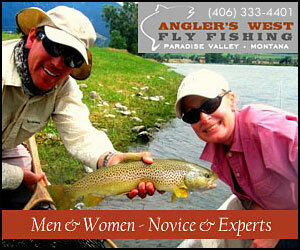 Complete fly shop and guide service in Livingston MT which specializes in our backyard water, the Yellowstone River. Visit our site for reports, conditions, and trip ideas. 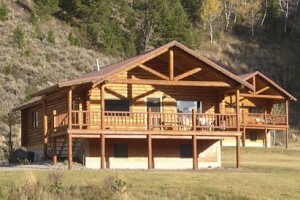 Simple and comfortable lodging in Gardiner, overlooking the magnificent Yellowstone River. Pets welcome (small deposit), plus a family suite. What can I see and do along the Yellowstone River? Yellowstone Lake: The largest lake in the park hosts a number of activities. Most services are available along its western edge. You can rent a motor boat and head out to the depths to fish or cast a fly from the shore. Bring your own kayak and head out on a multi-day excursion to the far reaches of the lake. Stroll the boardwalk trail around West Thumb Geyser Basin, right on the water's edge. 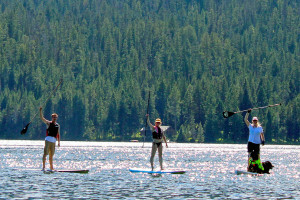 Camp right on the lake at Grant Village, Fishing Bridge, or Bridge Bay or enjoy park lodging at Yellowstone Lake Hotel, Grant Village, or Lake Lodge and Cabins. 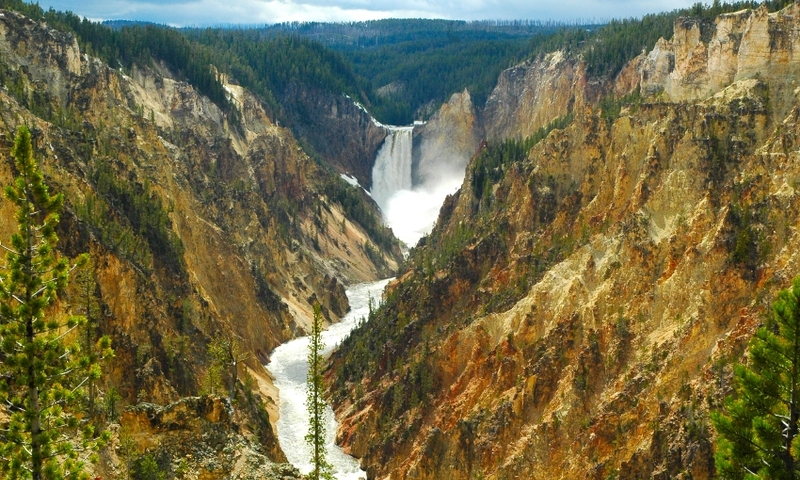 Grand Canyon of the Yellowstone: Explore one of the most beautiful attractions in the park, carved by the Yellowstone River. North and South Rim trails offer unique views of both the Upper and Lower Falls. Paradise Valley: North of the North Entrance to the park, the Yellowstone River flows through the town of Gardiner and Paradise Valley. 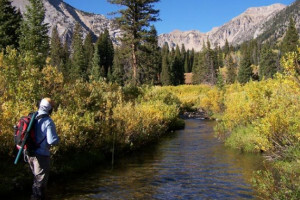 This area is known for fantastic fishing. Either float and fish or bring a pair of waders. Where is the Yellowstone River? Beginning in the southeast corner of Yellowstone National Park, the Yellowstone River flows into the Southeast Arm of Yellowstone Lake. It drains the lake at Fishing Bridge, at the lake's northern edge. The river then flows through Hayden Valley and into the Grand Canyon of the Yellowstone. It wraps back around to the west and flows through the Mammoth Hot Springs area and out the North Entrance of the park, through the town of Gardiner and Paradise Valley on its way to Livingston, Montana. From Livingston it flows east across the plains to where it eventually joins the Missouri River in North Dakota. When is the Yellowstone River accessible? Parts of the Yellowstone River are accessible year-round. In the winter, take a snowcoach ride to the edge of Yellowstone Lake and the Grand Canyon of the Yellowstone. Montana's Yellowstone River is the longest undammed river in the United States.